**THE POST BELOW WAS ORIGINALLY PUBLISHED ON OCTOBER 29, 2006. It was my very first blog post, and it explains my initial reason for blogging . . .
About 6 years ago I was made aware of a "blog". I began reading various blogs of people I actually knew--my brother's was the first blog I ever read. Sadly, he no longer blogs. But he opened a window into the world of blogging for me. I have been blogging now for almost 4 years. I currently write for 4 different blogs. My children also have their own private blogs. My very first post dates back to October 29, 2006. I just re-read it and thought I'd copy and paste it here, for you to read so that you could have a better understanding of why I started blogging in the first place. My reasons for blogging may have changed somewhat since my initial post nearly 4 years ago. While I still hold the same initial reasons for blogging, it has also become important because it is an outlet for me to write. Writing is therapeutic for me. I also appreciate the new blogging friends I have made over the years. I've got many American friends now, whom I am sure I would not "know" if it weren't for blogging! My blog is also a way for friends and family to get a little "picture" into my world. Cheesecake. I love eating cheesecake. I love making cheesecake. Why do I have these pictures of cheesecake on my very first blog post, you ask? Well, I searched my digital photos and could not locate a picture of myself to use as an introductory photo. 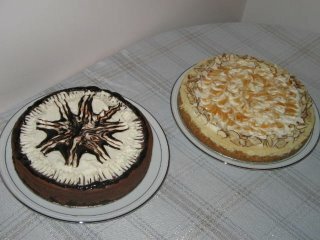 So, I came across this picture of cheesecakes I recently made for my new sister-in-law's bridal shower. Silly, I know. But, these creations actually tell a lot about me, for those of you who don't know me. I love to bake. I love to be creative with my baking. And for me, especially when it comes to cheesecakes, presentation is everything. These two cheesecakes happen to be Chocolate-Orange Cheesecake and Caramel Apple Cheesecake. The chocolate-orange is an all-time favorite, but the caramel apple was a first-timer and it was absolutely LOVED by all. I spend a lot of time baking and cooking. I guess you could say that baking, in particular, is my hobby. Other people have hobbies of scrapbooking, crafting, knitting, gardening, etc. But my hobby is baking. If I'm feeling stressed out, I usually get out my recipe books and search for something to bake. I have tonnes of cookbooks and I often will just "read" cookbooks. I dream about creating things just like they are in the pictures, and this becomes my challenge. My family enjoys my hobby. Yes, my husband and sons really "appreciate" my hobby. So, I'm new to writing a blog. But, upon my own admission, I will tell you that I'm not totally new to the blogging world. It all started when my brother started a blog. Well, I'd read his blog every now-and-then. But then I noticed his "links" and that opened up a whole new world for me. A world that I appreciate and enjoy. There are many blogs that I read regularly, just for the encouragement they provide. And I feel like I know so many of you just from reading your blogs. For those of you who are expecting babies, I anticipate the arrival of your child and I haven't even met you! And for those of you who report on your children and life in general, I love reading about your world. It's a strange phenomenon, this blogging world. And due to future events pending in my life, I feel that I need to start a "blogging connection" with the outside world. You see, we are in the process of moving. We currently live in a town of just under 5,000 people, close to a major city. Lord willing, if our house sells (it's been on the market for 6 days and we've had quite a bit of interest), we will be moving to an acreage in a different part of the province, about 45 minutes from the major city we live near, BUT only 20 minutes away from my husband's workplace. My husband currently drives a total of two-and-a-half hours a day to and from work, and it is taking its toll on him. So, we kind of need to move. He loves his job and we've always wanted to move to an acreage. Now seems to be time God's allowing this to happen, so long as we can sell our house. We have an offer on an acreage at the moment, and the final condition to remove is the sale of our existing home. So to make a long story short . . . I really enjoy the daily human ADULT contact I have living where we do now, and needless to say, once we're on the acreage, I won't have that contact as much or as often. I think that maybe blogging would be a good way for me to at least get my thoughts out and have feedback from fellow bloggers and create a basis for some "adult" interaction every now and then. And that is why I'm starting this blog, Mission: Kim Possible! I chose the name because I have a God who makes anything possible, and He can do the seemingly impossible by using my life in this mission field we call Life. I'm looking forward to getting to you all more through this world of blogging. Until next time, God Bless You! Welcome to my blog! I am a 45-year-old Christian mother to three boys (one stepson and two biological) and wife of one husband. My stepson is on his own, my oldest son just started Bible College in the fall of 2017, and my youngest is 16 years old and in grade 11, doing online school at home under my supervision. I am employed part-time as the Assistant Children's Minister at our church, and I am also a substitute Educational Associate. I love administration, teaching, and learning. If I have any spare time I enjoy baking, cooking, eating, writing, singing, connecting with friends, reading and watching a select few television shows (my absolute favorites are Project Runway, Downton Abbey, Call the Midwife, The Great British Bake-Off and This is Us). I love my Savior, Jesus Christ. It is my relationship with HIM that gets me through my days. I love animals, especially dogs and polar bears. I live on an acreage in the Saskatchewan prairies, and I have no cats (we're working on taming some strays, but so far they haven't claimed our yard as home), and five dogs. I love the color pink and my favorite number is SEVEN! And last but not least, I am an avid fan of the Toronto Maple Leafs and the Toronto Blue Jays. Please leave a comment after you visit. Thanks! In 2014 it is my goal to become "FAT-ter" . . . more Faithful, more Available and more Teachable. (Thanks to my sister, Connie, who shared that acronym with me a few weeks ago). With God's help I ask that the circumstances of my life will cultivate the inner beauty that He desires for me. "Your adornment must not be merely external—braiding the hair, and wearing gold jewelry, or putting on dresses; but let it be the hidden person of the heart, with the imperishable quality of a gentle and quiet spirit, which is precious in the sight of God." Why "Mission: Grace Lives Here"? In 2013 I chose to embrace the Grace which God has freely given me. I attempted to do my best to make more of an effort to extend grace to others. 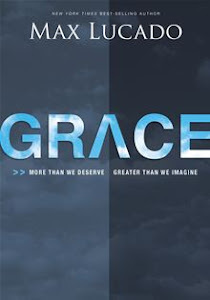 My inspiration to make 2013 a "Mission of Grace" came from a book by Max Lucado, entitled, Grace. Throughout the year I hoped to share stories of how I saw God's grace in action. May I be reminded that because Jesus lives in me, He must also live through me as I extend Grace to others. 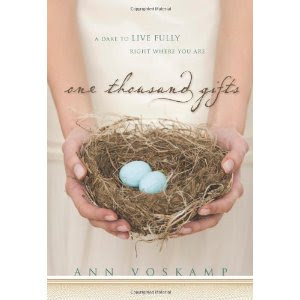 On January 1, 2012, I began something called "The Joy Dare", which was inspired by the book, One Thousand Gifts, by Ann Voskamp. I have dedicated the posts of 2012 to being the reflection of a thankful heart. I wish to view my world through glasses that are grateful, no matter what comes my way. I wish to live out I Thessalonians 5:18 . . . "give thanks in all circumstances." Most posts from 2012 relate to my journey of thanksgiving, which I continued to pursue in 2013 by way of a personal, hand-written journal. "This is how much God loved the world: He gave his Son, his one and only Son. And this is why: so that no one need be destroyed; by believing in him, anyone can have a whole and lasting life. God didn't go to all the trouble of sending his Son merely to point an accusing finger, telling the world how bad it was. He came to help, to put the world right again. Anyone who trusts in him is acquitted; anyone who refuses to trust him has long since been under the death sentence without knowing it. And why? Because of that person's failure to believe in the one-of-a-kind Son of God when introduced to him."